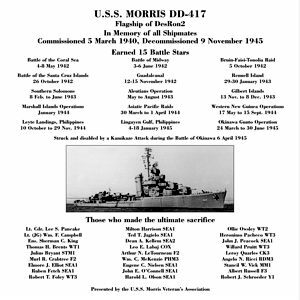 The seventh USS Morris, DD 417, flagship of Destroyer Squadron Two in World War II, was a ship of many distinctions. Her first commanding officer was Comdr. Harry B. (“Uncle Beanie”) Jarrett, USN, under whom she operated in the North Atlantic Patrol as flagship of Destroyer Squadron 2 from the summer of 1941. In December, while other ships of the squadron transferred to the Pacific, Morris remained at Charleston where she became the first US destroyer fitted with fire control radar (see photos). Rejoining her squadron at Pearl Harbor in February 1942, Morris was present at both the Battles of the Coral Sea and of Midway in May and June. She was damaged at the former while rescuing 500 crewmembers of the sinking carrier Lexington, CV 2. Quickly repaired at Pearl Harbor, she picked up 193 Yorktown shipmates when that carrier was torpedoed during the latter battle. Then in October, during the Guadalcanal campaign, she took off more than 500 survivors of the sinking Hornet, CV 8, following the Battle of the Santa Cruz Islands, again damaging her superstructure. In May 1943, Morris was transferred to the Aleutian Islands; then overhauled before returning to the Central Pacific. During the Gilbert Islands operation, she stood by a sinking carrier for a fourth time—Liscome Bay, CVE 56. She also participated in the Marshall Islands operation, the occupation of New Guinea, the landings at Leyte and the occupation of the Philippines. On 6 April 1945, off Okinawa, Morris was crashed on the forecastle by a “Kate” bomber carrying a heavy bomb or torpedo. The explosion heavily damaged her bow, blew out plating on her starboard side and caused fires, which spread quickly and continued to burn for more than two hours. After temporary repairs at Kerama Retto off Okinawa, she departed 22 May and arrived at Hunters Point, San Francisco 18 June. Although repairs were begun, they were suspended when Japan’s war effort collapsed. Morris decommissioned 9 November 1945, was struck from the Naval Register 28 November, was stripped and sold to Franklin Shipwrecking 2 August 1947, and finally was scrapped at Terminal Island by National Metal & Steel Corp. in 1949. Morris earned 15 battle stars during her World War II career. * Morris, Charles, Autobiography of Commodore Charles Morris, USN, Annapolis, Naval Institute Press, 2002. first published in Naval Institute Proceedings magazine in 1880.